Pay your bill online with ease with Windermere Pool's online bill pay. Enjoy a month of free pool cleaning and maintenance service when you refer a friend to Windermere Pools! Click here for details. We offer swimming pool maintenance and cleaning services to Central Florida residents, proudly serving the West Orange County area since 1987. We service and repair swimming pools in West Orange including those in Windermere, Winter Garden, Ocoee, Oakland, Lake Buena Vista, Gotha, Metro West, Dr. Phillips, and Bay Hill. We are truly never far away if you should need us. 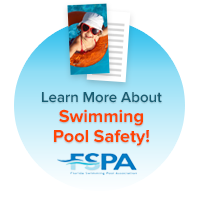 We are licensed and insured to service residential swimming pools. 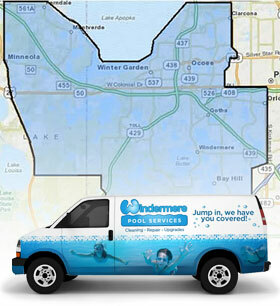 Windermere Pool Services offers weekly swimming pool cleaning services, maintenance, repairs and products to Orlando and the surrounding area. Windermere Pool Services has cleaned, repaired and maintained thousands of pools. We provide swimming pool services for areas throughout Orlando and Central Florida, including Bay Hill, Dr. Phillips, Gotha, Lake Buena Vista, Metro West, Ocoee, Oakland, Windermere and Winter Garden. Not sure if you are in our service range?